Northern Ireland Secretary Karen Bradley has been urged not to cut MLAs’ pay by a number of DUP MPs in the Commons. 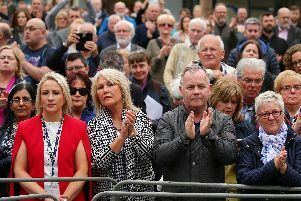 As new legislation – designed to address the issue of MLAs’ salaries during the Stormont political impasse – was introduced at Westminster, Karen Bradley heard calls that the majority of “hard-working” public representatives should not suffer due to Sinn Fein’s refusal to re-establish the power-sharing Executive. The Northern Ireland Assembly Members (Pay) Bill would enable Mrs Bradley to make a determination on pay during the period without an Executive, though does not itself make any changes to MLA pay or allowances. Last year, Mrs Bradley’s predecessor James Brokenshire commissioned former Assembly chief executive Trevor Reaney to examine the controversial issue of paying MLAs who have now not sat at the Assembly for 14 months. Mr Reaney recommended the 27.5% cut, a move that would take the standard salary rate of £49,500 down to £35,888. Mrs Bradley said she was still “minded to follow” the recommendation but said she continued to encourage representations from parties “before bringing forward a determination on wider changes to pay and allowances under this bill”. “I cannot act to put a determination in place until this bill has been passed by both Houses and received Royal Assent,” she added. Gavin Robinson praised the work ethic of Stormont’s MLAs “who would have the Northern Ireland Executive and Assembly established and working again tomorrow,” but are being “frustrated” from doing their jobs. The bill cleared the Commons without amendment and will be scrutinised in the Lords at a later date.